As disappointed as I am that the Supreme Court of Kenya (SCOK) has validated the results of the 2013 Elections despite what I would describe as compelling evidence of “massive systemic failure” of the election process, I respect its decision and commit to move on. And as noted in a previous post “The Loyal Opposition and The Fruit,” I fully expected SCOK to uphold Jubilee’s victory review of the polling data notwithstanding. I also noted that when it came to pass, the losing CORD candidates, Raila Odinga in particular, should play the role of the respectful and loyal opposition while mentoring upcoming socio-political leaders. His experience as a reformer is invaluable. I respect SCOK’s decision because according to the March 30 issue of the Daily Nation in an article titled Supreme Court upholds Uhuru’s election as president, the decision was unanimous. It is encouraging that the five (5) justices AND their chief, Chief Justice Mutunga ALL agreed that Messr’s Uhuru Kenyatta and William Ruto were validly elected as president and vice-president respectively. I am, however, left wondering whether the phenomenon groupthink1 was at work here. 1 – A psychological phenomenon that occurs within a group of people, in which the desire for harmony or conformity in the group results in an incorrect or deviant decision-making outcome. Like someone told me the other day: Opinions are like (fill in your favorite part of the human anatomy), everyone has one. To wit; it is my opinion that SCOK’s decision overlooked the data as presented by Ms. Kilonzo and Mr. Oraro including the admission by Jubilee’s own lawyer Mr. Ngatia that even though there were admitted “clerical errors” tallying the various results from the sampled polling centers, “no mischief” was intended “at all!” I am not a statistician but I have worked and interacted with some of the best statisticians and mathematicians over the past 20+ years in the medical device manufacturing industry here in Silicon Valley. I will say that if I conducted a test that yielded data similar to the data set presented before SCOK by Ms. Kilonzo and Mr. Oraro, peer review would fail my test and compel me to repeat said test – period! The one qualifier I would add to my contention is this: The threshold for reliability of and confidence in election results based on a small sampling of selected polling stations may be different from that reliability and confidence requirements for testing/qualifying processes used to manufacture medical devices! It is just “kitu kidogo – something small” to expedite issuance of a driver’s license, conveniently overlook some code violations when conducting a building or road inspection or “miss” seeing the bald front tires or faulty brakes on a public service vehicle during a traffic stop! No “mischief” may have been intended in the foregoing scenarios but the end results of these “vitu vidogo” is there for all to see: Drivers who can barely drive let alone understand/obey traffic rules, construction – roads and buildings – that crumble and fall apart shortly after being commissioned leaving death, destruction and misery in their wake and carnage on the road due to accidents caused by a combination of ill-gotten driver’s licenses, drunk driving, vehicles that are not road-worthy and supposed highways in various stages of dis-repair. In short, the culture of so-called and allegedly un-mischievous/benign “clerical errors, typos, computer glitches, vitu vidogo” has mutated into a cancer that is slowly but surely killing the national spirit and cohesion! But hey…”nothing mischievous was intended.” It was just something small. The foregoing aside, the Supreme Court has rendered its verdict: Uhuru Muigai Kenyatta and William Samoei Ruto are scheduled to be sworn in as President and Vice-President of Kenya on April 9, 2013. They will then have about two months before they board the plane to The Hague for their date with Ms. Fatu Bensouda on charges of crimes against the very humanity that elected them into office. At least we now have Jubilee’s lawyer Mr. Fred Ngatia conceding that “there may have been clerical errors here and there…” even as he quickly follows that concession with a Ronald Reaganesque-like addendum that “….no mischief can be attributed to these (clerical errors) at all.” And since he, Mr. Ngatia, on behalf of his clients who are both facing criminal charges at The Hague, say that “no mischief can be attributed to the ‘clerical error’,” all Kenyans should believe him! These individuals, Mr. Kenyatta and Mr. Ruto that is, are after all paragons of virtue and integrity! To paraphrase a popular saying here in the US: a clerical error here, a typing error there, a computer glitch here, a rounding error there and soon we have an 833,000 voting advantage! 4. Missing aggregate results from Form 36 (used to tally final vote counts). To use another popular expression stateside, especially amongst our distant cousins, African-Americans: Ni**a please!! Document Dump: The act of responding to an adversary’s request for information by presenting the adversary with a large quantity of data that is transferred in a manner that indicates unfriendliness, hostility, or a legal conflict between the transmitter and the receiver of the information. The shipment of dumped documents is unsorted, or contains a large quantity of information that is extraneous to the issue under inquiry, or is presented in an untimely manner, or some combination of these three characteristics. The phrase is often used by lawyers (and politicians)…It is often seen as part of the characteristic behavior of an entity that is engaging in an ongoing pattern of activities intended to cover up unethical or criminal conduct. 1 – Source: Daily Nation, March 28, 2013, Recount reveals vote irregularities. A back-of-a-napkin analysis of the foregoing numbers point to a systemic failure of the election process during the 2013 Elections. In analyzing 7.6% of the constituencies, we have anomalies affecting 6-10% of the votes cast! Expand this to all 291 constituencies and we have an (election) outcome that is an epic failure and is absolutely unreliable; one that confirms CORD’s basic contention of a massive breakdown of Kenya’s electioneering process/system during the elections necessitating negation or questioning of the final results. If the data provided by the re-count and summarized above does not provide the Supreme Court with enough evidence to prove CORD’s contention, then I am not sure how they are interpreting the results of the recount nor do I don’t know what more they need to address CORD’s petition. I make this statement irrespective of who benefits from the breakdown. Partial Justice is NOT Impartial Justice! •	While providing the “complete IT infrastructure” within a compressed time is indeed laborious, isn’t the quest for justice THE over-arching issue? •	Is the laborious nature of the request (for the complete IT infrastructure) the only reason the request was denied? Why didn’t the court allow an audit of randomly selected infrastructure components, especially those containing suspect data i.e. from constituencies that were under suspicion? •	Isn’t there the risk of missing evidence that may bolster CORD’s case or validate IEBC’s ruling? •	Doesn’t this ruling, at a minimum, give the impression of an incomplete, partial or selective hearing of the evidence thus de-legitimizing the petition process and its end result – determining who won the presidential elections of 2013? Like all Kenyans, I want the petition resolved expeditiously and peacefully. I then want the country to move forward, regardless of the outcome but to paraphrase a saying, “partial justice is not impartial justice.” The Supreme Court is doing the country a disservice by refusing to review ALL the evidence. Once Uhuru is safely ensconced in State House and the generational leadership change supposedly prophesized by the felled Mugumo Tree is fulfilled, then the hard work of leading and governing a divided and polarized Kenya begins. I say hard because of recent activities and utterances, not only by those tasked with leading the country including both Messer’s Kenyatta and Odinga, but by the general public as well, as reflected by the tone of the many comments posted in cyber space. The fact is: The manner and style of leadership and governance Kenyans have endured since independence has not reflected leadership and governance designed to build consensus between independent and co-equal branches of government. At the risk of incurring the wrath of some readers, I will further add that based on some of the comments in cyber space; it is not unreasonable or illogical to argue that the very notion of consensus-building and working across the aisle for the common good is “foreign” to the country! The post-election violence of 2007 caused by the rigged and manipulated presidential elections brought Kenyans face-to-face with ethnic violence and to the edge of a full-blown civil war. That dalliance with Rwanda-like violence compelled the international community in the person of Koffi Annan to force Mwai Kibaki to take on a governing partner in Prime Minister Raila Odinga. Prior to that, Kenya’s presidents – Kenyatta and Moi – ruled by fiat and diktat sans any opposition or dissent. After independence and through the early 90s, Kenyans and their politicians were a bunch sycophants who either “harambee’d” or “fuata’d nyayo”. Some did so because it was “their turn to eat” while others wanted to continue gorging at the trough of power. Still others sang the praise of Mzee or Nyayo because they did not want to be marginalized, demonized, detained, threatened with bodily harm, tortured or assassinated! Some, including Raila and Hezekiah Ochuka sought to overthrow the government because they believed that a coup d’etat was the only way to bring about an open and fair political system! The promulgation of the New Constitution in 2010 and the push towards devolution of power offers Kenya the opportunity for an open and fair political system. In this new system, complete with independent institutions headed by independent and quasi-political appointees, Mr. Kenyatta will be facing a socio-political environment that is markedly different than the one faced – make that enjoyed – by his predecessors! Rather than govern as his father and Mr. Moi did, by brutally quashing opposition, Uhuru will have to find a way to build consensus and work across the aisle including with people who strongly disagree with him. Mr. Kenyatta fils will have to govern the country without the literal “bully pulpit” and impunity (which is very different from immunity) enjoyed by his predecessors, including Kenyatta pere. Uhuru Kenyatta will also have the laser-like focus of the international community, not to mention the International Criminal Court (ICC) trained on him. Leading a diverse constitutional democratic country divided along tribal lines is a challenge Mr. Kenyatta appears to have embarked on in fits and starts. The “warning” he issued to Mr. Odinga was presumptuous and reminiscence of his father’s numerous admonitions to his political opponents during his reign, including to one Jaramogi Oginga Odinga, Raila’s father! While Uhuru’s warning was necessary given the heightened tensions that gripped the country after the IEBC announced the election results, Mr. Kenyatta’s stock as a leader of ALL Kenyans would have risen significantly had he issued, magnanimously methinks, the warning to ALL Kenyans. I am glad the High Court stepped in and cautioned both principals and by extension, their supporters and surrogates against litigating the pending petition in the court of public opinion. I would add that the exemplary behavior of Kenyans as they cast their votes on March 4 notwithstanding, the High Court’s caution speaks to the collective inability of Kenyans to responsibly exercise their democratic rights at the next (higher level) of the democratic process – governing a disparate polity. That inability to disagree without letting the disagreement degenerate into violence is indication of the still-budding maturity and nascence of said democratic process. While the significance of Gatundu in the annals of Kenya’s presidential history is unquestioned, indeed unparalleled, Uhuru’s visit to his ancestral home, coming around the time the elders of Giakanja Village in Nyeri proclaimed that his court-pending victory fulfilled the prophecy of the felled Mugumo Tree was insensitive and tone-deaf because it reinforced the myth that the Kenyan presidency is the sole purview of some but not others. Political leadership is about timing, symbolism and perception. Mr. Kenyatta could have waited before making the pilgrim to Gatundu. He is yet to be sworn in as POK (President Of Kenya) and in all fairness, it is way too early, indeed unfair to read much into the president-elect’s early moves but it is my hope that Mr. Kenyatta will steady his “sea legs” and find firm and steady footing as Kenya’s 4th president. As I watch the unfolding political drama surrounding the just concluded 2013 Elections from here in the US, I realize that Kenya, like America, is becoming a nation divided between “old thinking” and “forward thinking” and not in the way presented by Jubilee’s Uhuru Kenyatta. Mr. Kenyatta, the poster-child for Kenya’s entrenched establishment courtesy of his stock as son of the country’s first president and wealthiest family famously urged Raila Odinga, a key player in Kenya’s fight for reforming the very entrenched interests Uhuru and the Kenyatta family embodies, to step down and let the younger generation i.e. Uhuru and Ruto implement said reforms! It should be noted that Raila’s pedigree is nothing to sneeze at. His father Jaramogi Oginga Odinga was Kenya’s first vice-president, the country’s first true opposition leader and Uhuru’s father’s nemesis! The “old thinking”/“forward thinking” divide refers to the tried and true politics of “divide-and-conquer” first originated by the British colonialists. The same “divide-and-conquer” meme, also known as tribalism was then perfected by Mzee Jomo Kenyatta during his presidency and re-loaded in its full glory during Daniel Arap Moi’s quarter century reign. I would argue that tribalism as a way to govern was quasi-mothballed by Mwai Kibaki, especially going into his first presidential term in 2002 when the slogan “Kibaki Tosha” was all the rage and a nod towards a broader base of progressive-thinking Kenyans who came together under the National Rainbow Coalition (NARC) banner to face Kenya African National Union (KANU) headed by none other than Uhuru Kenyatta, the centerpiece of “old thinking” President Moi’s “Uhuru Project”! Unfortunately, the politics of tribe reared its ugly head again in 2007; this time with fury and vengeance not previously seen in the country as neighbors turned on one another. The post-election violence (PEV) of 2007 was caused when the “old thinking” sought to manipulate the election results in their favor and in so doing, miscalculated the public’s reaction and resolve. Finally, the “old thinking” that sought to divide-and-conquer Kenyans along tribal lines was revved up and executed to near-perfection by Jubilee’s Uhuru/Ruto during the 2013 race! At the end of the day, democratic politics is about the hard numbers and hats off to Jubilee for realizing that and ruthlessly capitalizing on it but at what price? At a very tertiary level, I would say that the current socio-political dynamics between the top two political parties of the country of my birth Kenya mirrors the socio-political dynamics between the top two political parties of my adopted country America. I would argue that Coalition Of Reform and Democracy (CORD) is to Kenya’s political landscape what the Democratic Party is to American politics. Similarly, Kenya’s Jubilee Coalition is the equivalent of America’s Grand Old Party (GOP) also known as the Republican Party. CORD’s Raila Odinga may be chronologically older than Jubilee’s Uhuru Kenyatta but the socio-political history and perspectives offered and practiced by the two candidates is completely reversed with the latter not only offering a campaign strategy that mirrored the divide-and-conquer/tribal-based agenda of yesteryears, but rhetoric that sounded eerily like that of his late father Mzee Jomo Kenyatta replete with “warnings to political opponents”, the occasional use of coded language (via use of tribal dialect) at rallies and the myriad “blessings” in church! Conversely, Raila offered a campaign strategy that sought to and succeeded in bringing together a broader cross-section of Kenyans only to be done in by the “tyranny of numbers” and possible skullduggery the “old thinking” has mastered! Here stateside, the Republican Party successfully run the same “old thinking” playbook against the Democratic Party for several years. Candidates from Richard Nixon in the 1960s to Ronald Reagan in the 1980s and most recently George W. Bush, especially during the GOP Primaries in 2000 flawlessly executed the “Southern Strategy” by exploiting the racist and xenophobic instincts of white Americans in southern states such as Georgia, Texas, Alabama, Mississippi, Kentucky etc. By accentuating the racist and bigoted views white voters had of non-whites, the GOP religiously won these southern states and patched together enough votes in the “battleground states” of Florida, North Carolina, Virginia, Colorado, Minnesota, Ohio, Illinois, Pennsylvania to win the White House 7 times from the late 1960s through the 1980s and again in 2000 and 2004. The potency of racism and bigotry in the political calculus of the southern states is illustrated by a quote attributed to Lyndon Johnson, the Democratic President from 1964-1968. President Johnson famously said that “the Democrats just delivered the South to the Republican party for a long time to come” shortly after signing the Civil Rights Act of 1964 (CRA) that outlawed discrimination against African-Americans and women, including all forms of segregation. The Act terminated unequal application in regards to voter registration requirements and all forms of racial segregation in schools, in the workplace and by facilities that offered services to the general public. In short, the CRA opened up the socio-political process, previously denied to women and African-Americans! In 2008, a “forward thinking” presidential candidate, one Barack Hussein Obama, building on his famous keynote “One America” speech at the 2004 Democratic Convention in Boston, called out the cynicism and division embodied in the “Southern Strategy” for what it was: A racist, xenophobic and crass political tactic that played to the negative stereotypes Americans had of one another. By challenging Americans to look beyond race, gender, cultural and economic differences, then-Senator Obama swept to victory, first in the 2008 Democratic Party primaries against Hillary R. Clinton – until then the prohibitive favorite and establishment pick with privileged upbringing. Obama than walloped an “old thinking” son-of-privilege Vietnam Vet and GOP candidate Sen. John McCain in the presidential race. In 2012 he defeated yet another “old thinking” and son-of-privilege Mitt Romney. The Republican Party is currently going through some soul-searching as it asks the question: What went wrong , especially in the 2012 Presidential Election when it was cocksure that the faltering US economy and the oftentimes racist and xenophobic tone of its campaign/candidates would send the Kenyan-born Muslim and Wuod K’Ogelo” from the White House back to – K’Ogelo? 1. Kenya’s 2013 vote map looks like America’s 2012 vote map albeit along tribal/regional lines with Mandera in Kenya’s north-east mimicking Alaska in America’s north-west as a Jubilee enclave in the CORD dominated Eastern/Coastal region of Kenya, to wit, Jubilee’s appeal among voters was concentrated in the central region of the country. 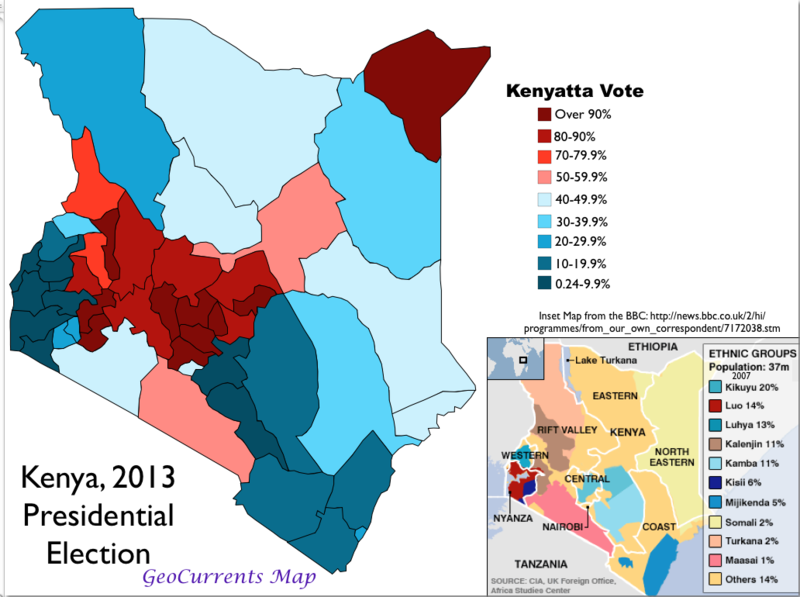 CORD’s appeal was more spread out – http://geocurrents.info/wp-content/uploads/2013/03/Kenya-2013-Election-Map.png. 2. Jubilee got almost 60% of its votes from one region – Central. CORD got just over 50% of its votes from four regions – Eastern, Nairobi, Nyanza and Western. 3. Of the 291 constituencies that voted, 157 (54%) voted for CORD vs. 134 (46%) for Jubilee. Note: The 291 includes votes from the Diaspora who voted 52.5% vs. 41% in favor of CORD. 4. CORD won eight of the ten most populous cities/towns in the country (http://en.wikipedia.org/wiki/Kenya), by a margin of 2,079,331 (59.6%) vs. 1,408,961 (40.4%). The figures include figures from the constituencies proximal to the city/town. Trans Nzoia figures were used for Kitale. a. Nairobi, arguably the most “diverse” population center voted in favor of CORD: 691,156 (49.4%) vs. 659,490 (47.2%). b. Mombasa County, another “diverse” population center voted 70.5% vs. 24.1% in favor of CORD. These foregoing figures tell a compelling story about Kenya and Kenyans. They also tell a story about the two campaigns. One campaign ran a race based on pure unadulterated tribal arithmetic; the Kenyan version of the “Southern Strategy”. Jubilee knew that with the two most populous tribes in the country – Kikuyu and Kalenjin – forming its core constituents, they had the numbers just as the Republican Party of yesteryears knew it did because the most populous (white demographic) formed its core constituent. Jubilee played that hand to the hilt, throwing in demonization of the very (ICC) process its vice-presidential candidate, Mr. Ruto, voiced full-throated support of for good measure! Politics is indeed the art of the possible; it is also a contact sport! The Uhuru/Ruto rallies took on a John McCain/Sarah Palin or Mitt Romney/Paul Ryan vibe as the two crimes-against-humanity suspects successfully characterized the charges facing them as charges brought on by “them”, by “foreigners” including Raila Odinga against “us” i.e. the Kikuyu and Kalenjin communities even though the summons from the International Criminal Court (ICC) clearly and succinctly identified each suspect by name: Uhuru Muigai Kenyatta and William Kipchirchir Samoei Ruto not by tribe or community! Think Sarah Palin blaming Obama for endangering America by “palling around with terrorists” or John Sununu attributing the moribund US economy to Obama’s “laziness” and the fact that he does not know how to “be an American”. CORD on the other hand sought to make their failed 2013 campaign a choice between the entrenched establishment and the progressives in the country who want power and resources distributed equally throughout the country – devolution. As illustrated by the numbers, the CORD coalition, like the “forward thinking” Obama/Biden ticket of 2012 sought and garnered support across communities large and small. Unlike the Romney/Ryan rallies whose images consisted of faces that all looked alike, the Obama/Biden ticket was a collage of Americans; indeed colorful and beautiful! At the end though, democratic politics is about the number of votes received and Jubilee received enough votes to be declared the victor, this time. As was the case with Richard Nixon, Ronald Reagan and Bush pere et fils, the “Southern Strategy” worked for the GOP in the short term. The strategy also alienated the patchwork of groups that form the American quilt: Women, minorities (Blacks, Latinos, Asians), young and old educated ergo open-minded Whites thereby setting the stage for Obama’s victories in 2008 and 2012. The racially-tinged tone of the GOP message finally caught up with the party and has put it on life-support unless it can re-brand itself into a “forward thinking” and inclusive party able to share power WITH all groups! The clock is ticking for Kenya’s Republican Party – Jubilee. © [WashingtonM.Osiro] and [http://thetwoninetyonetracker.com], . Unauthorized use and/or duplication of this material without express and written permission from this blog’s author and/or owner is strictly prohibited. Excerpts and links may be used, provided that full and clear credit is given to [WashingtonM.Osiro] and [http://thetwoninetyonetracker.com] with appropriate and specific direction to the original content.